100 poems about 100 places in England, that tell a history of the country. A book, a show, and an exhibition as part of the Turner Prize 2019 offsite programme. Supported using public funding by Arts Council England, and with the support of Turner Contemporary, Dreamland Margate, Towner Art Gallery, Theatre Absolute and others. This 1.5 hour long walk explored a town’s rich industrial heritage – saltworks, copperas, tarmacadam, clay – steam engines, windfarms, seaforts and estuary. A guided walk by Dan Thompson accompanied by a series of objects made by Liz Lake, ending with tea at Keith Brymer Jones’ Whitstable studio. Walks have also been part of The Hartlepool Monkey (2017), From Wasteland To Wasteland (2018), It’s All About The Road (2014-15), and Made In Worthing (2009-10). Dawn Cole, Lorna Dallas Conte, Helder Clara, Dan Thompson and Graham Ward are making initial work and developing a prolonged project in response to the Lochnagar Crater, France and TS Eliot’s The Waste Land. The five artists visited the crater in March 2017. A First Friday in Margate showed work-in-progress in June 2017, with an exhibition at Lombard Street Gallery Margate in February 2018 as part of Turner Contemporary’s offsite programme. The Thanet Press archives and Martell Press archives come together in this project, exploring the social history of printworks on the Isle of Thanet. Letterpress workshops, new artwork, and an annual Old Print Workers’ Social. Started with the support of Jameson Works. A festival exploring the places social activism and art meet, curated with local people and taking over Swansea’s High Street for two days. Included community commissions, work with local shops, galleries and businesses, and guest artists including Mark Thomas, Stella Duffy, and Bernadette Russell. A series of conversations about society, activism, politics and citizenship. Held across the UK, these conversations took in from 2-10 people in places like Stoke-on-Trent, Swansea, Margate, and with Towner Gallery, Eastbourne. The MV Empire Windrush and the SS Arcadia both docked at the Tilbury Terminal. Three works – signal flags in Margate and Tilbury, and a reading room onboard LV21 in Gravesend, across the river from the terminal – explored themes of empire and arcadia, immigration and emigration. The works were conceived during a Metal residency in Southend, and exhibited during the first Estuary Festival. The ‘Arcadia’ flags subsequently toured as backdrop to The Libertines stadium shows in South America. TribevTribe was a game which used the town of Margate itself as the board. It celebrated Margate’s place as a home to youth culture, and layered that past over the present townscape. Players picked up a card to play, and it gave them a place in a tribe – Mods, Rockers, Hippies, Punks or Ravers. Players then moved through the town, and in and out of history, winning points by completing simple challenges, finding clues like reproductions of original gig posters, and recording their visits to venues including Dreamland, The Shell Grotto, Turner Contemporary and independent businesses. As they played they win points for their tribe, and each week, the dozen venues in the game were won or lost by a tribe. Over 100 people played and at the end of four weeks, the Mods won. One of the reproduction posters – for a gig by The Lower Third, shown here – has mistakenly been used in the 2016 David Bowie biography, Hero. The stories collected from one road become the history of a city, and that becomes the history of England. From June 2014-June 2015 Dan Thompson was artist in residence on London Road in Stoke, where 150,000 pieces of pottery are made by Portmeirion, and 15,000 buns are baked in a steam-powered bakehouse every week. Dan’s discovered lost canals, lost railways, and a million lost golfballs, and found connections to Margate, Charles Darwin, the man who designed the most reproduced work of art ever, and Jonah. Dan wrote a book, It’s All About The Road, starting in the Ice Age and ending twenty years in the future. he also worked with local artists, makers and designers to celebrate London Road’s stories. He held Art Lunches, seedfunded #chumbrella, led walks and commissioned Bottom Knocker, a piece of music made from sounds recorded in the Portmeirion Factory. A year as artist-in-residence for the whole road, collecting stories, working alongside local people, and making connections. This year-long artwork has been commissioned by Appetite, one of Arts Council England’s Creative People & Places programmes, with local community groups SWOCA and Second Look Stoke. You can follow the progress, and join in with the project, with theTwitter hashtag #allabouttheroad or on a Facebook page. Margate clothes store Rat Race wanted a new look and flavour. Rather than design a logo, Dan created a flexible and adaptable kit of colours, patterns, copywriting and typography. It reflects elements of Mod, Skinhead and Scooterist culture without being tied to any one, helping Rat Race celebrate 60 years of street style and subculture in Margate. Bedford is, according to the Office For National Statistics, one of the unhappiest places in England. A three-month commission from Bedford Creative Arts saw workshops and meetings across the town, having a conversation about happiness with everyone from mental health service users to the Polish School. The results of this work inspired a playful town-wide artwork, Bedford Happy, which encouraged people to explore, find moments of happiness, and take away limited edition prints and other artworks. The Isle of Thanet in Kent has a wealth of small museums and attractions, the legacy of a long-time tourist industry. #KYOKent was a game which joined them up, and introduced school teachers and local students to the resources nearby. A mysterious trunk, found in a junk shop, couldn’t be opened; did the markings and labels on the outside give clues to where it had been? Local schools borrowed the trunk, investigated it, and worked out the story. At the end, they were invited to send a few students on a bus tour around the places they’d uncovered before they watched museum experts open it at the Powell Cotton Museum. An afternoon to celebrate Margate’s iconic Dreamland amusement park moving into public ownership. Built a temporary event arena using upcycled materials found on the site, set up simple activities to capture the people’s history of the park, staged a bubble-blowing flash mob and welcomed 2300 visitors. the whole things was wrapped in a special temporary Dreamland branding, created to look as if it itself a piece of the site’s history. The musical movement started in the early 1990s, and this stage show brought together three people who were there; Dodgy’s drummer Mathew Priest, Paul Weller bassist and former Blow Up DJ Andy Lewis, me and a box of 7″ singles at Brighton’s Hotel Peliroco. Commissioned by Ludic Rooms and the Coventry Mysteries Festival. An A5 fanzine, full of psychogeographical ideas, provocations and actions, giving the reader a chance to see the city in a different way. 1000 copies, given away free from Ludic Rooms festival shop. Worthing Pier has been burnt down, blown down and blown up. 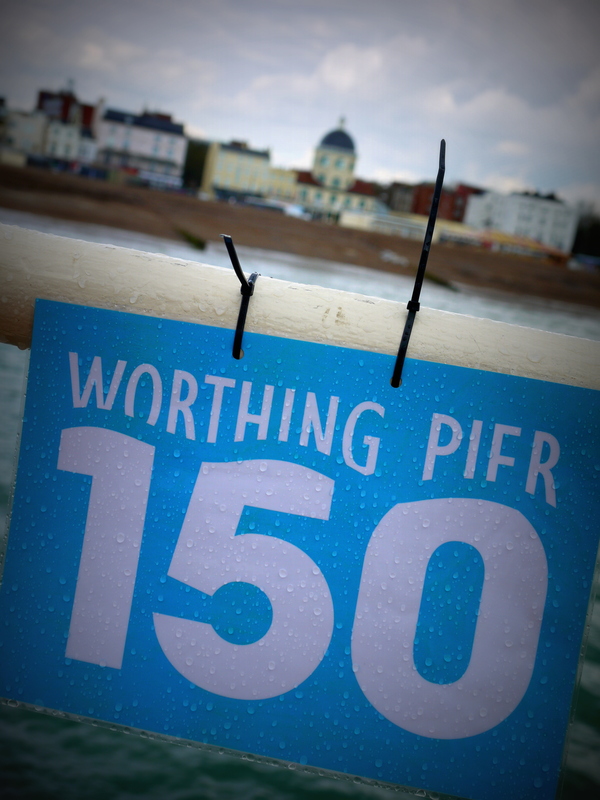 To mark the 150th birthday, I was commissioned by Worthing Borough Council and held a birthday party at the sea end. It included live calypso, a choir singing happy birthday, a picnic, a giant pier-shaped cake, a bubble-blowing flashmob and badges. Inspired by the Mass Observation movement and the resurgence in seaside tourism, eleven local primary schools were brought together by Dan and The Littlehampton Academy, and asked to make observations about their town. The results were shown in Ministry of Littlehampton, an empty shop used to create a pop up alternative tourist information centre for Littlehampton. In the woods in Sussex, near the site of a Home Guard Auxiliary Unit camp. Five boxes of books acquired from a closed-down bookshop burnt. Created during a four day in Leeds, which included a psychogeographical meander with writer Phil Kirby, and a public workshop at Armley Mills. 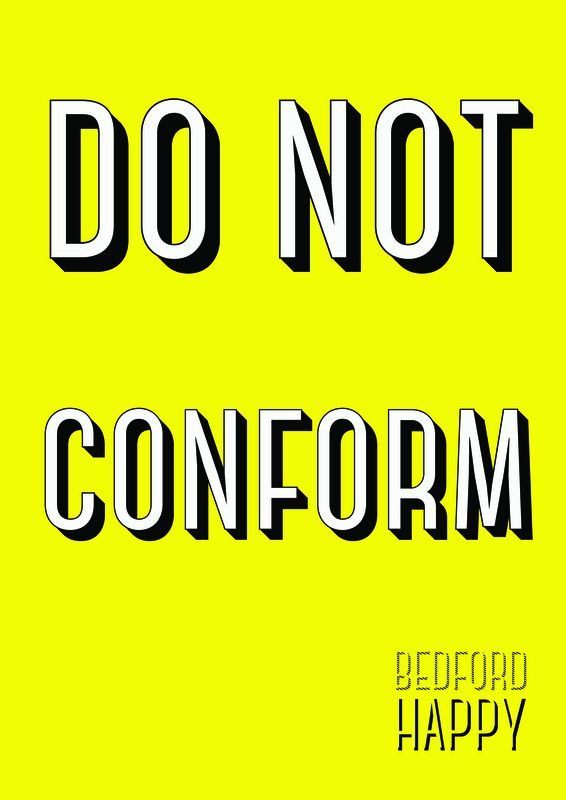 Originally conceived as a fanzine, but produced as a Tumblr website. Worthing beach, between the pier and the Lido. Ten fragments of timber, each a few centimetres long, were saved from the load of timber shed by the Ice Prince, which had washed up on Worthing beach. They were frozen in the centre of blocks of ice, kept for a year, and released into the sea at dawn on the first anniversary of the shipwreck. A dozen musicians who had never met, composer Adam Swayne and a church. Together, we created a new piece of improvised music inspired by the ice prince shipwreck and the timber it left on Worthing beach. An exhibition at Worthing Library of things found in secondhand books. Shopping lists, photographs, postcards, letters, bookmarks, receipts, travel tickets and much more. Accompanied by a fanzine, and an explanation that I had never found a slice of bacon in a book, and that this recurring story might be an urban myth. Reported on the front page of The Argus and subsequently in the national press, by which time I was a librarian and I had found a slice of bacon in a book. I spent one day walking around Worthing delivering gifts. I made the first gift: the first participant, when receiving the gift, give me another to pass on to the next participant and so on. Nobody except me knew who was receiving the gift they were giving. The world’s smallest art gallery was opened in Worthing. A professional gallery space, it’s curated usually by me but occasionally by friends. It has two floors, and a loft space, and the walls are about 40cm long and 30cm high, meaning artists have to produce work that’s roughly 1/12th of the size they’d usually work at. 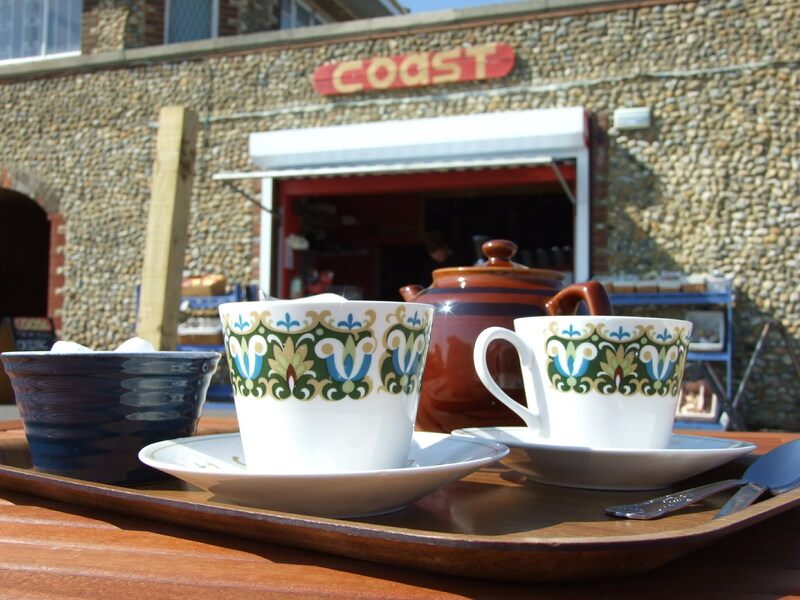 When Coast cafe opened on the beach at Worthing, they wanted a bold, artist-made sign which could be used as their branding. The original sign was handpainted on heavy pine boards from the Ice prince shipwreck, and a chunky font inspired by old letterpress which was intended to make the sign a one-off. A church wanted to explore ideas of democracy with their congregation and local community. I created a one-evening election campaign, and invited everyone to vote. One person abstained. You could vote, broadly, for a right-wing, nationalistic party promising British homes and jobs for British people; or a left-wing party promising a welfare state, and better public services. At the end of the evening the left appeared to have won. In fact all the policies, right and left, were put forward by Germany’s National Socialist Party in the 1930s. The Nazis had won. The Alchemic Resource Centre was established by artist Karin Paish on the Shoreham houseboat Yerba Buena. A series of events were planned, inviting artists working in different ways to come together around a colour. The only event which happened was Pink-o-rama and, while other artists explored the pink of flowers, sunsets or of naked flesh, I filled a room in the boat with dayglo pink paper, kitsch pink objects, trashy plastic toys and pink shop mannequins. A performance about being awkward, or being persistent, depending on your perspective. Carried out in Worthing town centre, while Harry Palmer made the same line in Hull. Walking in a straight line – no deviation, pausing to get around people, climbing over street furniture, sticking at it from one end of the street to the other. A performance at Worthing Museum and Art Gallery. Reading various poems, song lyrics and quotes in a 45-minute performance, while my head was shaved. Included words by Blur, TS Eliot, Picabia, Brecht, and a list of the zones from the shipping forecast.